An art deco dining room provides the perfect stage for a chef’s dramatic cooking techniques. There’s a new show in Tinseltown and its name is Gwen. “Hollywood used to have this allure, and I feel like the community can bring it back,” says Australian chef Curtis Stone, whose new restaurant is up- ping the fine-dining ante on Sunset Boulevard. The high ceilings and gracious volume of 4,500 square feet give the brasserie the air of a grand art deco theater, where the audience watches Stone dramatically prepare fire-cooked meats in the open kitchen. moves the guest emotionally,” says Oliver Haslegrave, half of the sibling duo behind Home Studios, the Brooklyn firm that Stone and his co-owner brother Luke tapped for the project. On their home turf, the Haslegrave brothers are known for creating hits like Tørst beer bar and the Michelin-starred Luksus hidden behind it, beloved Williamsburg cocktail bar Donna, and lauded downtown bistro Rebelle. 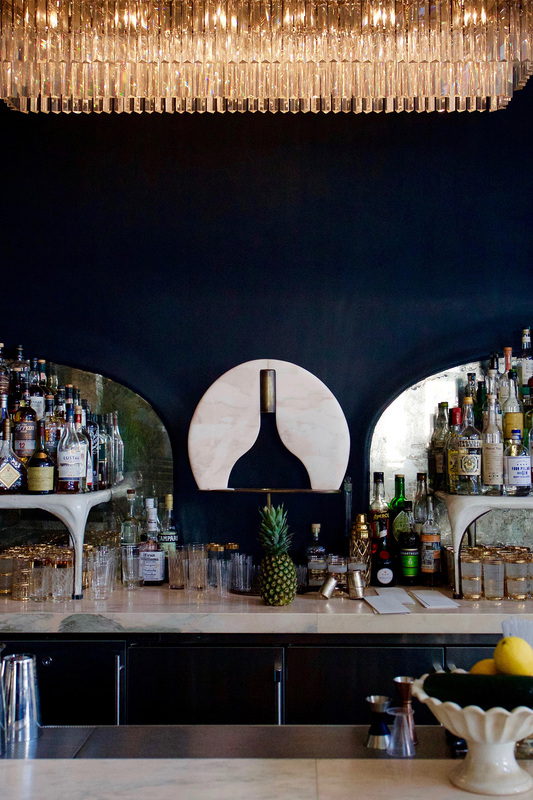 Lately, though, the upstart firm has been branching out in cities like Knoxville, Tennessee and New Orleans, where they designed an oyster bar for the new Ace Hotel, and now L.A., bringing their end-to-end, holistic process to larger and more ambitious projects. In typical fashion, whatever they can’t find, they make themselves. For Gwen— their largest commercial space and first in L.A.—they fabricated custom din- ing tables, waiter stations, wall mirrors, lamps, and even the triptychs adorning the walls in their Brooklyn studio. They also collaborated with the Nicaragua-based Maderas Collective on steel, wood, and velvet dining chairs. 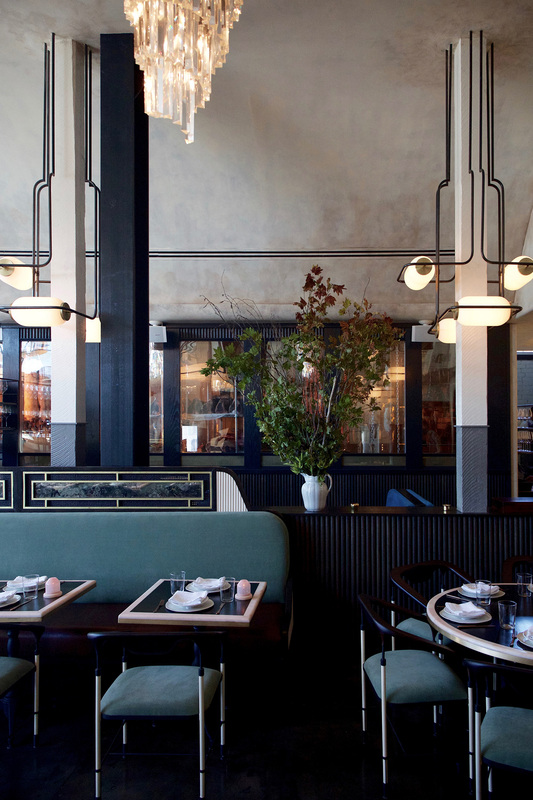 Stone, known for his acclaimed Beverly Hills tasting-menu temple, Maude, and appearances on Bravo’s Top Chef Masters, sees Gwen as a contemporary take on the art deco era, not just a recreation of it. “The design is sometimes pigeonholed as ‘Old Hollywood’ and there’s certainly some strong themes of that, but it’s not forced, nor The Great Gatsby in nature,” he says. “There are modern elements to the space that give it a unique edge.” Haslegrave adds, “We bring as much thought and creativity as we can to the design to create an alchemy, so that it feels both welcoming and new.” Proof of this can be found at the on-site butcher, which hawks gamey cuts of rabbit and grouse. An artisanal meat purveyor in Hollywood? All part of its next act.